Barszcz/Beet Soup – Vegan Mofo 2017 – Pleased to Beet You. – vegan in your city. Home Polish Food Barszcz/Beet Soup – Vegan Mofo 2017 – Pleased to Beet You. 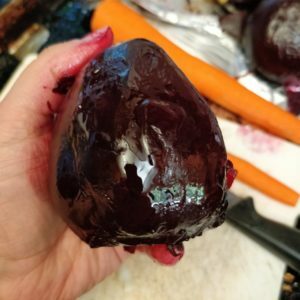 Beets are a regular player in traditional Polish cooking, and Eastern European cooking in general, so I’m going talk about them every darn Tuesday for the rest of October. I’d like to start with something traditional as heck, with some minor augmentations. Beet soup. You might know it as borcht. I know it as barszcz. It’s all basically the same thing, we can agree to disagree. Beets + Broth = soup. Usually sour cream is involved. Sometimes some kind of sausage. But even with the most hearty seeming recipes, I often find myself hungry soon after. So with this recipe, I’m trying to avoid using special ingredients (but tofutti sour cream is absolutely fantastic in this soup if you have it around/or want to use it) and replacing sour cream with a dollop of white bean puree. It really works – you can mix the white bean in with the soup before plating, or let folks do it afterwards – it’s a great nutritional boost, and adds a thicker texture to the soup. 1/2 cup dry navy beans (or 1 can, drained) (or white northern beans), prepared. Preheat your oven to 200C (400F) while you prepare your veggies. Bake the beets and leek with some oil (for approximately 30 minutes). I drizzled my beets with oil and wrapped them in aluminum foil, but you could also use a dish with a lid if you’re avoiding the ol’ foil scene. Prepare your navy beans according to package instructions – I used my instant pot and made a large batch of navy beans for other recipes I’m planning to make this week. It’s a great opportunity to have some extra beans kicking around. You can store them in the refrigerator for a few days, or drain them and freeze them for more longterm storage. Wait for your beets to be finished baking. While you are waiting for your beets and leeks to cool off and your navy beans to cook, heat up 2 tbsp of oil in a large pot and stir in the onion and carrots, let them cook until onions are translucent. Are your beets cool? Great. Who doesn’t like a cool beet? Now you can peel em, and dice them up, and throw them in the pot with the rest of the vegetables (don’t forget about your delicious garlic and leeks). Now it’s show time. Add the broth, bay leaf, and pepper. Let it all cook together on low medium heat for 20 minutes, or until carrots are tender, throw in the lemon juice and splash of vinegar (I used rice vinegar) and cook for another 5 minutes. Remove the bay leaf before serving. While the soup is cooking up, boil your potatoes – you want them nice and tender. I did not peel mine because I like the added texture of the skin, when they are soft, smash them up. Chop up your dill or just rip it apart into little dill pieces. Hope you like it because we certainly did tonight! Oooh, great idea with the bean puree – definitely more filling! 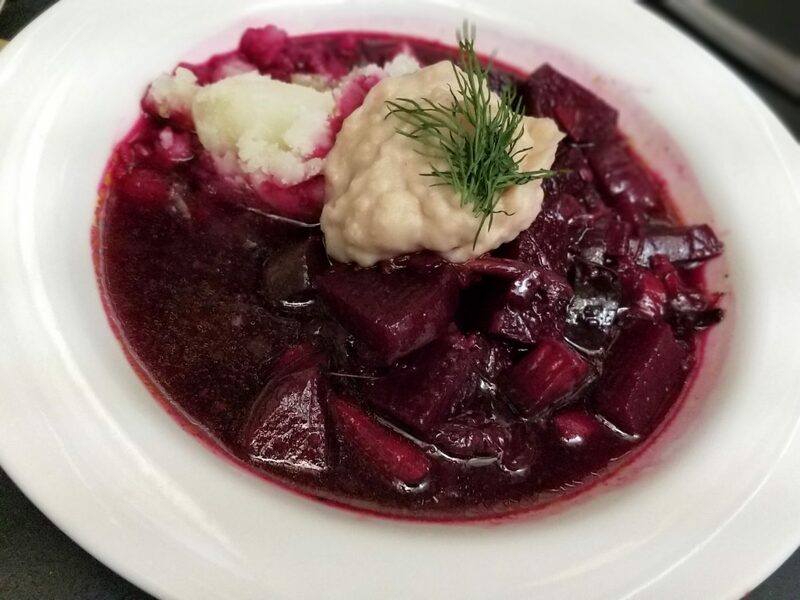 Borscht (or barszcz) is such an appealing colour, it’s always a gorgeous dish.